Today's the day you can finally go buy it (please note the above image is actually the DVD cover which will be released seven weeks from today). Rather than link you to Amazon again I'm going to send you to the SurLaLune blog HERE, where yesterday Heidi gave details of a discount coupon available for a very limited period of time. She also linked to the various packages available for you (thanks Heidi!). In honor of this landmark film being released in the best quality available to us today, rather than talk about the Blu-ray product again I want to point you toward a couple of other related things. 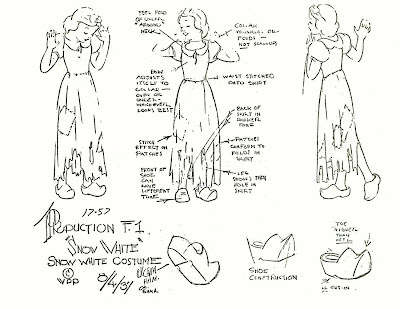 The first is a very interesting article HERE in which Lella Smith, the Creative Director of Disney's Animation Research Library was interviewed about the restoration of the film and the sort of information the ARL staff are 'privy to' and 'keepers of'. 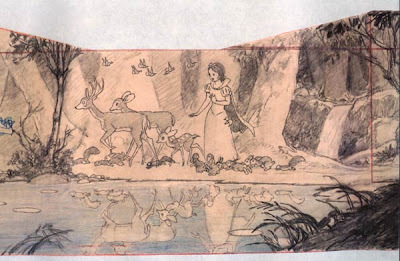 I haven't seen more than small quotes from ARL librarians before so this extended article (it is longer than an average article) is a treat and uncovers more of Disney's consideration of the Grimm's tale than you usually hear of. Can you talk about a few of the differences from the Brothers Grimm? We talked a bit about it from the Brothers Grimm telling to the Disney telling. Lella Smith: Sure, one of my favorite subjects. Well, you know, Snow White was a story that had been around for decades and decades in an oral tradition. And in many different countries there were subtle changes and not so subtle changes. In one of the stories I remember I think it was in an Italian version the huntsman was supposed to cut off Snow White's toe and use it as a stopper in a bottle of her blood. You know, there were lots of changes in the story. 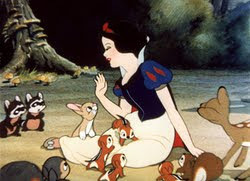 And Snow White who was seven years old and the daughter of the queen, that was pretty frightening to think about. 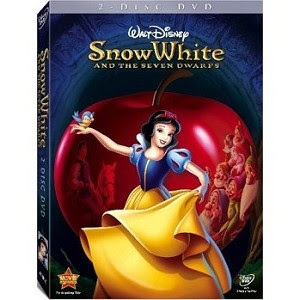 So when Walt began to decide about his Snow White although she is young, I've seen his story note that says look, she has to be old enough to be able to consider marriage. So, you know, and they thought out those differences. The huntsman depending on which fairy tale you read sometimes he had to bring back the liver, sometimes the heart. So that changed with different tellings. And in some tellings the queen was to dance in the hot - shoes that had been put in the hot coals until she dropped dead. So, you know, Walt Disney said wait a minute, let's get rid of the queen earlier so that we can celebrate the happiness of the story. So in fact he had the witch fall off the cliff so that the prince and Snow White could then celebrate their happiness together in the forest. So there were lots of subtle changes but they were all done with a purpose. 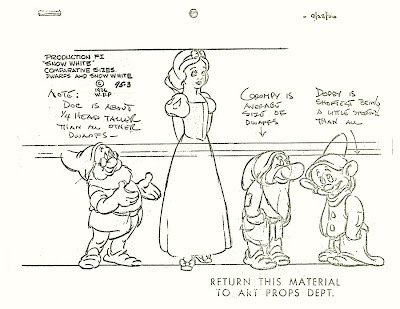 Another change was that in the original version you remember that the queen came three times to try to kill Snow White and each time - the first two times the dwarfs arrived home in plenty of time to save her but the third time they didn't. And so, you know, Walt said well one poison apple is enough, let's get it over with so that change was made. But there were - they were changes that were not made without a lot of thought because to him, he was taking well known stories and transferring them to a different kind of medium, the screen. And so he had to in some ways expand the story to full length film. In some ways he had to simplify the story so that it wouldn't be overcomplicated on screen. And when you think about it, these were changes that were no different from changes made in one telling to the next telling. Often when tellers told these fairy tales they would make little changes depending on how, you know, they felt the story should go. So it was continuation of the idea that fairy tales are oral tradition and until, you know, they were written down by the Grimms Brothers, you know, they were just pretty much all over the place. 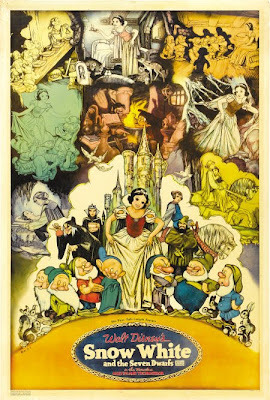 Lella Smith: ...we're opening an exhibition on November 15 in New Orleans called Dreams Come True, Art of the Classic Fairy Tales from the Walt Disney Studio. And that is an exhibition that celebrates fairy tales, talks about how Walt Disney Studio changed them, some of the reasons they did, the elements of animation are represented in the exhibition and there will be about 800 works. So I wrote the catalog and the text labels and then we'll go there for the opening. And then we're working on books. We're just coming out with a book now the second in the animation archive series on animation. And we've just finished designing the design book which this is the third in the series of books. It's called the archive series that goes back and picks out the finest of the finest of the stories from our library, the finest animation, the finest design pieces, and puts them into a big book available on Amazon.com. It sounds like a fascinating exhibition. I only wish I could get to New Orleans to see it.